Password Director - password manager tool. 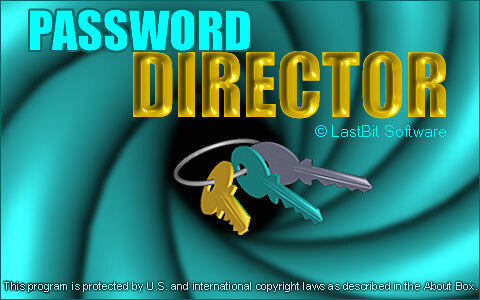 Password Director - award-winning, reliable, professional solution to managing your passwords! Password Director provides a safe and secure way to keep all your passwords and sensitive records (such as system logins, credit card information, PINs, private phone numbers and other sensitive records) in the single well-protected password database. You do not have to remember dozens of passwords anymore, just remember your single Master Password (password for the Password Database). Current version of Password Director does not support integration with Internet Explorer. Password Director is designed to store primerly document passwords. If you are looking for a password manager that is fully integrated with IE and allows internet form autofilling, take a look at MyPasswordManager.com. We recently acquired this project. Aurora Multiuser Password Manager - ideal password management solution for both corporate and individual users. Support of multiple users, Advanced Encryption Algorithm, SuperPaste feature and IE toolbar plug-in, possibility to store database on removable media (like USB) aren't the full list of features for Aurora Password Manager. Click here to learn more. Password Director keeps all your passwords in a single encoded file, the Password Database. Though nothing prevents you from creating several such files, we recommend you to use a single file to store all your passwords. At the first launch you will be offered to create a new Password Database or open an existing one. If you already used Password Director and you have the Password Database, open it. If you use Password Director for the first time, create your own Password Database. When creating the Password Database you should specify its name and the Master Password. It is very important for you to remember the Master Password, if you forget it, you will lose access to the Password Database. Luckily, the Master Password is the only password you should remember from now onwards. You can test the reliability of your password and use the "Suggest Password" function to let the software generate the password for you (more details will be given below). In addition to that you can remember the Master Password. It will be saved on your computer and you won't have to type it any time you would like to access the Password Database. But then, if strangers can access your computer they will be able to access your Password Database. Therefore we strongly recommend you to use the Remember Master Password option only provided that unauthorized people cannot access your computer in your absence. Initially the Password Database is empty. Password Director can help a user to select reliable and easily memorized passwords. It also Director consists mechanism for checking passwords quality. Using our Password Analyzing Service you can check if your password is weak. Approximate estimation of time required to recover the password will be also given. More about Password Director features learn here. Manual capture of passwords from applications. Password Director will capture passwords from all password text boxes on the screen. You can import passwords from CSV (Comma-Separated Values) files. You can run Password Director under Windows 95 if you have Internet Explorer 4.0 or later installed. and onscreen keyboard for Master Password entering. Onscreen keyboard input could not be intercepted with a keylogger.